It’s an eerie Monday morning here in Pasadena. The car is covered with ash, and the sunlight filters weird yellow through the dense smoky clouds. For coverage on the Sierra Madre fire, try Sierra Madre 91024 and The FC Blog. See also Flickr photo set here via Yausser. It pains me to state the obvious, but sometimes the little things matter. Sometimes the things that seem little are actually more important than one would think. The good news? 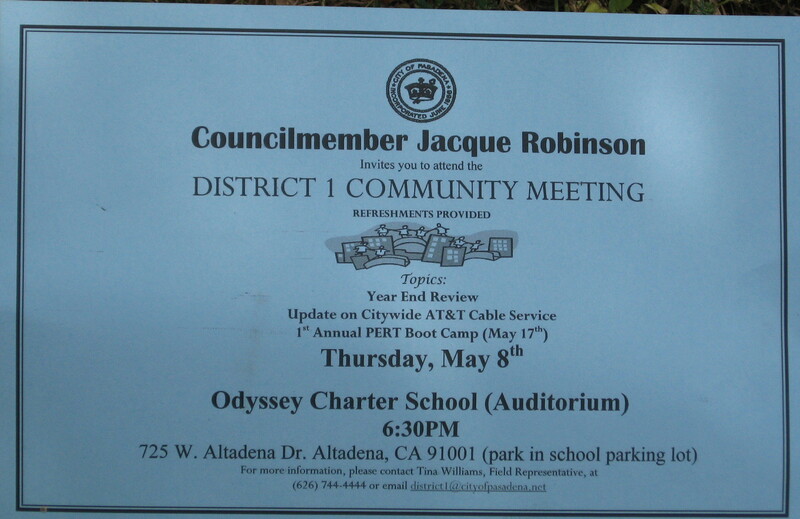 Councilmember Jacque Robinson is hosting a District 1 Community Meeting on Thursday, May 8, 2008 at 6:30 p.m. The bad news? The meeting is not being held in District 1. It’s not even being held in Pasadena. No, the meeting will be at Odyssey Charter School (Auditorium) at 725 W. Altadena Drive in Altadena. This little section of Altadena Drive is technically in Pasadena. It seems that District 1 meetings should be held in District 1. That would encourage folks to participate. That would make the meeting easier to get to. That would engender a sense of place. We have plenty of suitable locations to hold a meeting – La Pintoresca Library, the Jackie Robinson Center, Washington School, John Muir H.S. We have several nonprofits with decent-sized meeting rooms. Were none of these options available? Picking a central location in District 1 would be ideal. Picking ANY location in District 1 for a community meeting about city government should be de rigueur. Getting to the May 9 meeting via public transportation is akin to getting to Dodger Stadium via public transportation. In other words, take your car or get a ride with someone else. Your big option is MTA Bus 267 which runs along Lincoln Avenue. All ya’ll who live far east of Lincoln—walk or take the ARTS bus over. Good luck getting home. 1. Is this meeting really being held at the same exact time as the Northwest Commission meeting? 2. Why isn’t this meeting listed on the community calendar? 3. The District 5 meeting got a mention at the City’s Public Affairs website. Why not this one? Oh heck, I’ll send Ann an e-mail myself. 5. The meeting announcement gives no indication if transportation assistance is available, or if translation services will be available. Oh yeah, I’m moaning and groaning. Too bad I won’t be there. But I have a good reason. More on that later. This entry was posted on 28 April, 2008 at 10:31 am and is filed under Around Town. You can follow any responses to this entry through the RSS 2.0 feed. You can leave a response, or trackback from your own site. Here’s why the weird venue, Kelly– I think that Jacque Robinson scheduled the meeting at this location as a city annex aggressive move. She wants more territory. She wants her district, District 1, to be larger. Altadena, prepare to be assimilated. Resistance is futile. Robinson will bring out her Annexation Army militants at this meeting and declare a War on Altadena. It’s a coup attempt, I tell you! Thank you for pointing this out, when I noticed it I thought to myself “this is odd” but then I talked myself into thinking that I was just a fossilized curmudgeon. As for annexation I think it is a grand Idea, JR may have Altadena and access to the Baltic Sea as long as All of district 1 west of Forest be given to District 6. Wait, Jacque is The Borg? If she’s Borg – is she called “District 1 of 7”? Sorry to see you won’t be making the meeting. In any event, just wanted to let you and your readers know that District 1, in fact, includes Altadena addresses and residents who are lucky enough to be able to vote in both Pasadena AND Altadena. District 1 runs along Arroyo straight through Windsor (where the Vista Laguna’s and Florecita’s run as well as about 1/2 of Altadena Dr.) Odyssey is actually in the District. As a general rule, anyone can go to lavote.net and click on “District look up by address” on the right hand side and it will give you not only your City District, but Congress, Assembly, and all the other elected officials you’d like to contact for your address. As a general practice, I am making it a practice to move the meetings around the District so everyone has an opportunity to participate, including my Altadena constituents. Uh oh. It’s getting out of hand: Prepare 2 b assimilated. Resiztance iz futil. Congratulations on such a wonderful post. I really liked reading it. Thanks! !